These stunning Light Ivory pearl drop vintage bridal earrings by Mariell feature 6mm ivory pearls and jewel-encrusted french wire tops for a wedding day look with unforgettable retro glamour. The lustrous simulated pearls dangle in a pave cubic zirconia plated in Genuine Silver Platinum. We love how these top selling earrings seamlessly blend the elegant simplicity of pearls with the intricate details of antique reproduction jewelry. Whether for brides, bridesmaids, mothers of the bride, or wedding guests, these dainty 1" h earrings will add just the right touch of sophistication. 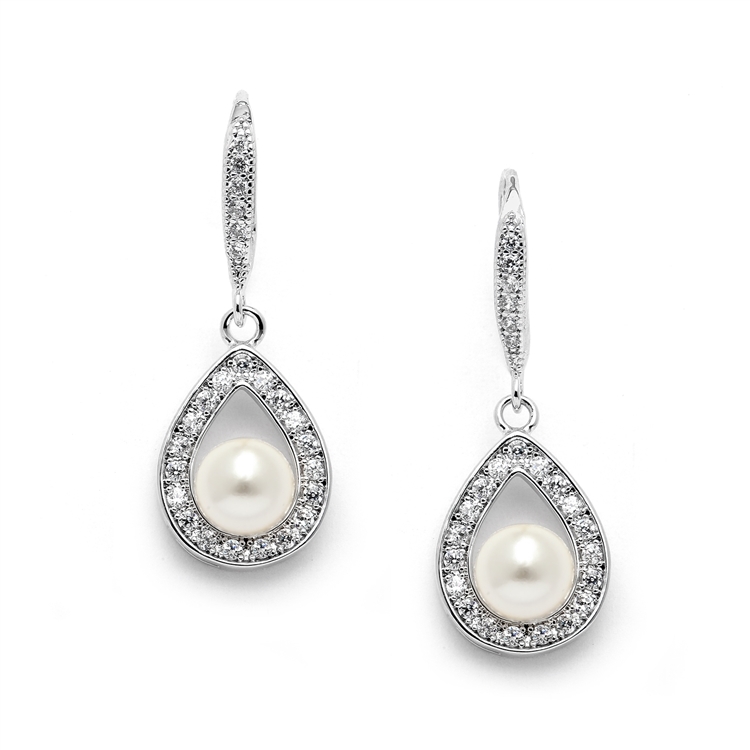 You'll be thrilled with the "dress up" or "dress down" versatility of these lovely Cubic Zirconia and pearl drop earrings. After your dressy frocks are neatly tucked back in the closet, wear these lightweight glistening beauties with your business wardrobe or jeans and a sweater for just a subtle splash of sparkle. We promise you'll fall in love with these customer favorite pearl dangles or your Money-Back.